Dominant trees and understory plants are very different for each of the three segments of this trail. All offer wonderful opportunities to enjoy the various wildlife species that inhabit the surrounding riparian areas. Explore them all, and you will feel like they have visited three different worlds. To Blue Fathom/Chupacabra Point - From US HWY 380, turn South on Exit 4/Tryall Drive. Turn right (West) on Port O Call Drive. Turn left (South) on Lanai Drive. Finally, turn left (South) onto Blue Fathom Drive. Proceed South on Blue Fathom drive, until reaching the Chupacabra put in point & kiosk on the South side of the roadway. Note: Invasive zebra mussels have been found in this area. To prevent further spread of this pest, paddlers are required to drain all water from their boats before leaving the river. Get details. Please note: All three creeks are subject to flash flooding, so pay attention to weather reports and avoid paddling these creeks in high water conditions. Crossing from Chupacabra Point to the creeks, paddlers might encounter head-on winds and/or chop crossing the open area of the lake. Regarding the depths in each creek, at normal levels, there are some areas in each creek that are shallow and if water levels are lower, will create portages. Willow Creek has a road crossing, so this will be a portage if paddlers wish to go further upstream. Runaway Bay has fair populations of white bass, crappie, and largemouth bass. White bass and crappie can be caught using jigs and spoons attached to medium and light action fishing equipment fished in open water and close to bridges. Largemouth bass can be caught using medium to heavy action fishing equipment using soft plastics fished around aquatic vegetation and standing timber. This area is characterized by riparian plant species common to the Cross Timbers ecoregion, including hackberry, several species of oak, honey mesquite, Osage orange (Bois d'arc) and ash. Shrubs such as coralberry, elderberry, and sumac are commonly found in the understory. Paddling along this series of trails offers an excellent opportunity to watch for songbirds, water birds, raptors, deer and squirrels. In fact, the bottomland areas throughout the Cross Timbers are excellent wildlife viewing areas, so be sure to bring along your bird book to identify the numerous species present. This 13,000 surface acre lake features over 170 miles of shoreline ranging from sandy beaches to sheer rock cliffs. Several boat launching facilities and waterfront businesses are available for your paddling or boating convenience. The lake is also home to the Methodist Camp and Conference Center and the 3,000+ acre Sid Richardson Scout Ranch. 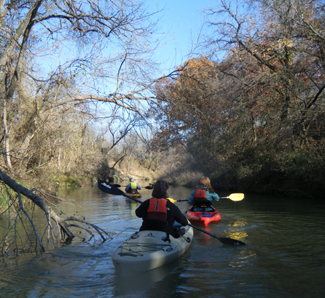 See Texas Paddling Trails Information provided by Bridgeport, Texas at the Bridgeport Falls Paddling Trail website. 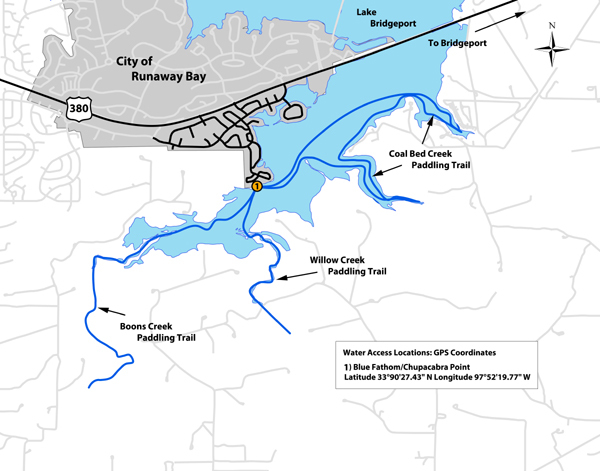 This trail was made possible through a partnership between Texas Parks and Wildlife Department and the City of Runaway Bay.